Here you can see all our accessories for this range. This vertical filter fan, EF, with a IP 54 protection degree, is easy to install thanks to its click-in feature. Unnecessary downtime is avoided, since water and dust are prevented from entering the enclosure through the filter, and the reliable fan motor will ensure constant ventilation. Filter fan for forced ventilation. Eldon filter fans save time on installation as they are installed with a click-in system without screws. The hinged front cover can be easily opened for quick and easy filter replacement. The airflow direction and the connection position can easily be changed. Front cover manufactured from injection-moulded thermoplastic, self-extinguishing, UL94V0. -40 °C to +55 °C. IP 54 | TYPE 12. Vertical filter fan, with a click-in installation feature, high quality motor and a IP 54 protection degree. The filter fan is reliable due to its high quality motor, as well as being easy to install. 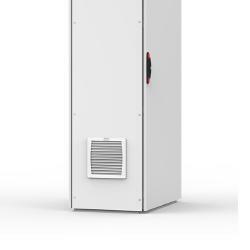 Component failure and unnecessary downtime is avoided as water and dust are prevented from entering the enclosure and the reliable motor ensures that there is constant ventilation. The click-in feature reduces the customer's labour cost due to the ease of installation. The filter fan should be installed together with at least one exhaust filter, EFA. Something went wrong! Please try again. We have sent this page. The receiver should get an email shortly. We have sent your information.